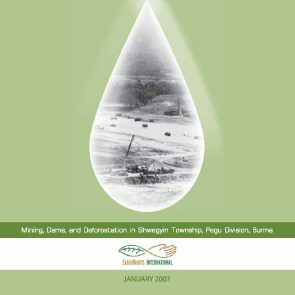 This report describes how human rights and environmental abuses continue to be a serious problem in eastern Pegu division, Burma – specifically, in Shwegyin township of Nyaunglebin District. The heavy militarization of the region, the indiscriminate granting of mining and logging concessions, and the construction of the Kyauk Naga Dam have led to forced labor, land confiscation, extortion, forced relocation, and the destruction of the natural environment. The human consequences of these practices, many of which violate customary and conventional international law, have been social unrest, increased financial hardship, and great personal suffering for the victims of human rights abuses. By contrast, the SPDC and its business partners have benefited greatly from this exploitation. The businessmen, through their contacts, have been able to rapidly expand their operations to exploit the township’s gold and timber resources. The SPDC, for its part, is getting rich off the fees and labor exacted from the villagers. Its dam project will forever change the geography of the area, at great personal cost to the villagers, but it will give the regime more electricity and water to irrigate its agro-business projects. Karen villagers in the area previously panned for gold and sold it to supplement their incomes from their fields and plantations. They have also long been involved in small-scale logging of the forests. In 1997, the SPDC and businessmen began to industrialize the exploitation of gold deposits and forests in the area. Businessmen from central Burma eventually arrived and in collusion with the Burmese Army gained mining concessions and began to force people off of their land. Villagers in the area continue to lose their land, and with it their ability to provide for themselves. The Army abuses local villagers, confi scates their land, and continues to extort their money. Commodity prices continue to rise, compounding the diffi culties of daily survival. Large numbers of migrant workers have moved into the area to work the mining concessions and log the forests. This has created a complicated tension between the Karen and these migrants. While the migrant workers are merely trying to earn enough money to feed their families, they are doing so on the Karen’s ancestral land and through the exploitation of local resources. Most of the migrant workers are Burman, which increases ethnic tensions in an area where Burmans often represent the SPDC and the Army and are already seen as sneaky and oppressive by the local Karen. These forms of exploitation increased since the announcement of the construction of the Kyauk Naga Dam in 2000, which is expected to be completed in late 2006. The SPDC has enabled the mining and logging companies to extract as much as they can before the area upstream of the dam is flooded. This situation has intensified and increased human rights violations against villagers in the area. The militarization of the region, as elsewhere, has resulted in forced labor, extortion of money, goods, and building materials, and forced relocation by the Army. In addition to these direct human rights violations, the mining and dam construction have also resulted in grave environmental degradation of the area. The mining process has resulted in toxic runoff that has damaged or destroyed fields and plantations downstream. The dam, once completed, will submerge fields, plantations, villages, and forests. In addition, the dam will be used to irrigate rubber plantations jointly owned by the SPDC and private business interests. The Burmese Army has also made moves to secure the area in the mountains to the east of the Shwegyin River. This has led to relocations and the forced displacement of thousands of Karen villagers living in the mountains. Once the Army has secured the area, the mining and logging companies will surely follow. This report is based on field surveys and in-depth interviews conducted by EarthRights International (ERI) in the district since 2001. Most of the information presented here was gathered between 2004 and 2005 from Burmese of different ethnic backgrounds. Many of the individuals interviewed worked for the different extractive industries that operate in the district either as miners, day laborers, loggers, or in other secondary occupations related to the exploitation of non-timber forest products, such as rattan and bamboo. Additional interviews were conducted with internally displaced persons (IDPs) hiding in remote areas of the district as well as former convict porters and soldiers who had defected from the Burmese Army.